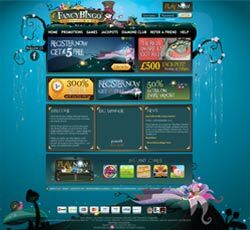 Fancy Bingo is the magical bingo wonderland offering players the chance to join the Fancy Hatter for some big jackpots and tasty promotions. As we’ll see in our Fancy Bingo review, Fancy is a unique bingo site and introduces you to its quirky style as soon as you arrive on the homepage, with the hatter lounging at the top of the page drinking a cup of tea! Dubbed the penny wonderland this site has lots of penny games with big cash prizes while the home page also has a news section at the bottom and a list of constantly updated big winners. It’s easy to get playing at Fancy, simply click on Join Now and make your first deposit to collect your welcome bonus. Fancy Bingo offers a great selection of bingo games, including 90 ball bingo, 75 ball bingo, 75 ball more winners bingo, guaranteed jackpot games and free bingo games. The guaranteed jackpot games have fun names such as The Cash Cow, The Mad Man Money, Plants of Love and The Mushroom Money, while the biggest jackpot game is Rich Dwarf, playing on Sunday which has a £500 guaranteed jackpot up for grabs. The Fancy That games play every Saturday giving roomies the chance to win exciting gifts for just 1p. Fancy also has a great selection of instant games, slots, casino table games and progressive titles waiting to be enjoyed, including instant tourney marathons, while chat games offer another way to get involved with the quirky action! Promotions at Fancy Bingo include regular games and bonuses, alongside a mix of brand new competitions very month. New players can enjoy a generous 300% welcome bonus as soon as they make their first deposit, so a deposit of £10 will get you £40 to play with right away, while there is also 50% extra available on all reloads. Every time you make a re-deposit at Fancy you will also be able to play in the Fancy Free games for 4 days where there is a £20 jackpot up for grabs every 30 minutes. Players who deposit every 4 days or more get access to over £1,200 in Daily Jackpot Games, free bingo games between 9am and 11pm and the exciting free ‘daily play’ game, Tea Party! In addition to all this there is the Fancy That game every Saturday which gives away themed gifts for just 1p. All players at Fancy Bingo also earn Diamonds as they rise through the VIP levels, which they can then exchange for cards to game, real cash and more in the Diamond Store. Fancy Bingo is regulated by Gibraltar Gambling Commissioner and licensed in Gibraltar. When you play at Fancy all your details are kept safe and secure with encryption technology, while the friendly support team are on hand to answer any queries. You can get in touch with the Fancy support team easily by heading to the Help page on the website where you will find a frequently asked questions section. For direct enquiries you can also contact the support staff by e-mail, post or live chat.